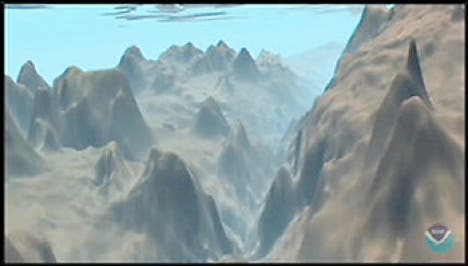 During a July 2011 voyage to the Pacific Ocean's Mariana Trench, the deepest region on the planet, Scripps researchers and National Geographic engineers deployed untethered free-falling/ascending landers equipped with digital video and lights to search the largely unexplored region. The team documented the deepest known existence of xenophyophores, single-celled animals exclusively found in deep-sea environments. The researchers spotted the life forms at depths up to 10,641 meters (6.6 miles) within the Sirena Deep of the Mariana Trench. The previous depth record for xenophyophores was approximately 7,500 meters (4.7 miles) in the New Hebrides Trench, although sightings in the deepest portion of the Mariana Trench have been reported. Scientists say xenophyophores are the largest individual cells in existence. Recent studies indicate that by trapping particles from the water, xenophyophores can concentrate high levels of lead, uranium and mercury and are thus likely highly resistant to large doses of heavy metals. They also are well suited to a life of darkness, low temperature and high pressure in the deep sea. "The research of Scripps Professor Lisa Levin (deep-sea biologist) has demonstrated that these organisms play host to diverse multicellular organisms," said Doug Bartlett, the Scripps marine microbiologist who organized the Mariana Trench expedition. "Thus the identification of these gigantic cells in one of the deepest marine environments on the planet opens up a whole new habitat for further study of biodiversity, biotechnological potential and extreme environment adaptation." The xenophyophores are just the tip of the iceberg when it comes to considerations of the nature and diversity of life at extreme depths. For example, according to Dhugal Lindsay (Japan Agency for Marine-Earth Science and Technology, or JAMSTEC), the Dropcam movie also depicts the deepest jellyfish observed to date. The instruments used to spot the mysterious animals were "Dropcams" developed and used by National Geographic Society Remote Imaging engineers Eric Berkenpas and Graham Wilhelm, participants in the July voyage. "The 'Dropcams' are versatile autonomous underwater cameras containing an HD camera and lighting inside of a glass bubble," said Berkenpas. "They were created by National Geographic engineers to allow scientists and filmmakers to capture high-quality footage from any depth in the ocean. The devices were baited and used 'camera-traps' to capture imagery of approaching marine life." "Seafloor animals are lured to the camera with bait, a technique first developed by Scripps Professor John Isaacs in the 1960s," said Kevin Hardy, a Scripps ocean engineer and cruise participant. Hardy advanced the ultra-deep glass sphere design used on 'Dropcams' more than a decade ago. "Scripps researchers hope to one day capture and return novel living animals to the laboratory for study in high pressure aquariums that replicate the trench environment." Also during the expedition, Scripps researchers successfully tested an advanced seafloor Deep Ocean Vehicle (DOV) design, using similar spheres to recover microbes and test other advanced system components. The xenophyophore sightings were positively identified by Scripps' Levin, director of the Scripps Center for Marine Biodiversity and Conservation, and confirmed by Andrew Gooday of the UK National Oceanography Center. "As one of very few taxa found exclusively in the deep sea, the xenophyophores are emblematic of what the deep sea offers. They are fascinating giants that are highly adapted to extreme conditions but at the same time are very fragile and poorly studied," said Levin. "These and many other structurally important organisms in the deep sea need our stewardship as human activities move to deeper waters."